Vada's Blog Stamp Inks and Paper : White on White with Decorative Edge. This is the current challenge at Our Creative Corner. I thought this would be an easy peasy challenge, but never though there would be so many different colors or shades of (White). 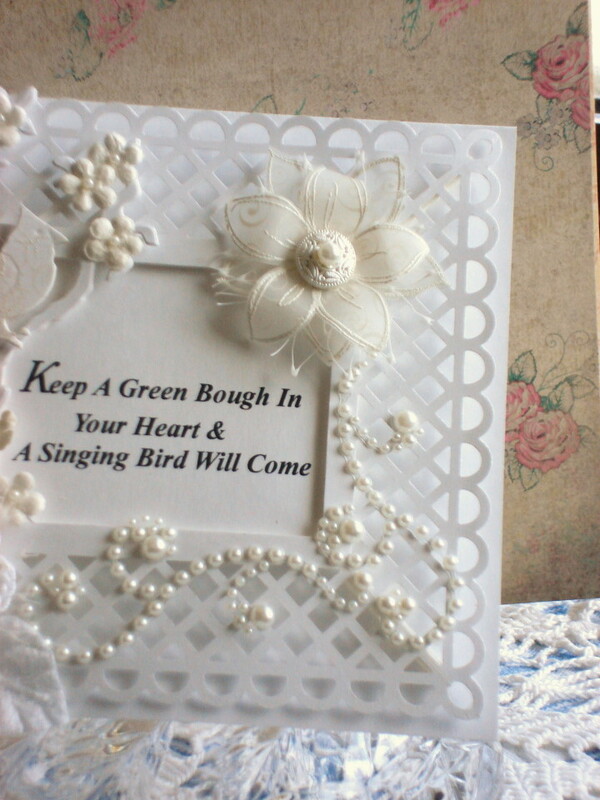 Funny even white embossing powder looks creamy, as well as white vellum turns to yellow tones. Oh well here’s my entry for this challenge. Using a Martha Steward punch called “Garden Trellis”, I punched the decorative edge. 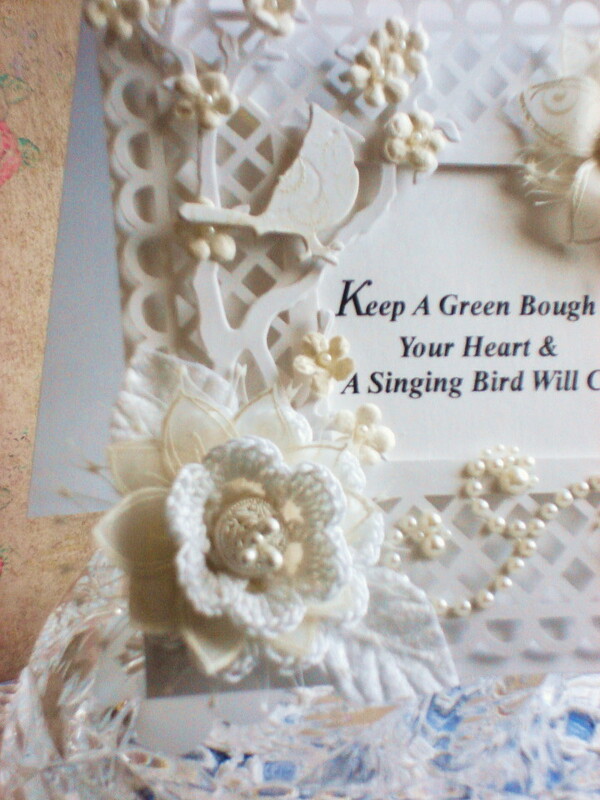 Then form Tim Holtz collection I used the following die, Bird Branch 637833, Cardinal 658266. The branch was cut four times from white cardstock. Same with the cardinal. 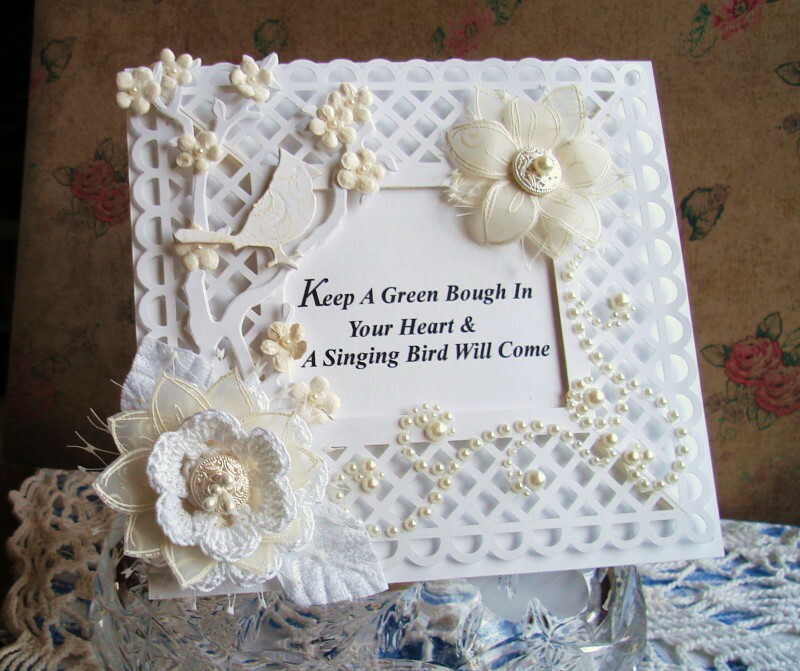 My flowers were stamped on vellum and embossed with white embossing powder, then cut out, stamp used was from Stampin’ Up. Embellishments from Keeping Memories, Michaels. Crocheted flowers and white plastic bag from my stash. Thanks for stopping by today, hope everyone is staying warm. Have a good creative day. Wow, this totally blew me away, Vada! It is exquisite, and absolute delight. 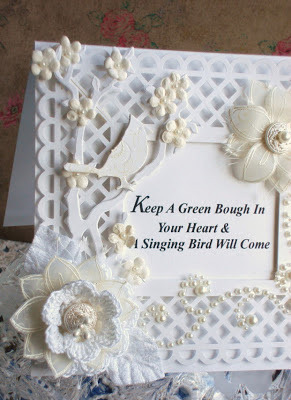 Your design, textures and embellishments all work together incredibly well. You totally rocked the challenge this week at Our Creative Corner. Thanks for sharing this beauty with us! 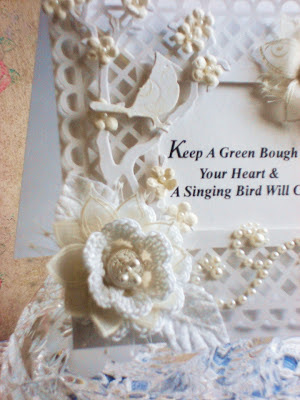 THIS IS A VERY IMPRESSIVE CARD AND A WONDERFUL TAKE ON OUR WHITE ON WHITE CHALLENGE. .
CONGRATULATIONS ON DOING SUCH A SUPERB JOB, THIS IS A BEAUTIFUL CREATION. THANK YOU FOR ENTERING OUR CREATIVE CORNER CHALLENGE THIS WEEK, I AM ALWAYS EXCITED WHEN I HAVE THE OPPORTUNITY TO VISIT A NEW BLOG, I MUST SAY THE DESIGN OF YOUR BLOG IS A WOW! Stunning Vada!! Every inch a masterpiece! I so know what you mean about the color white. When I'm painting I have several books with so many colors of white. Its unbelievable there can be so many! Vada, there may be many shades of white, but you nailed this, GF! All the details and special Vada treatments are incredible! Love this! So how cold are you???? Sending many warm hugs! Oh Vada! 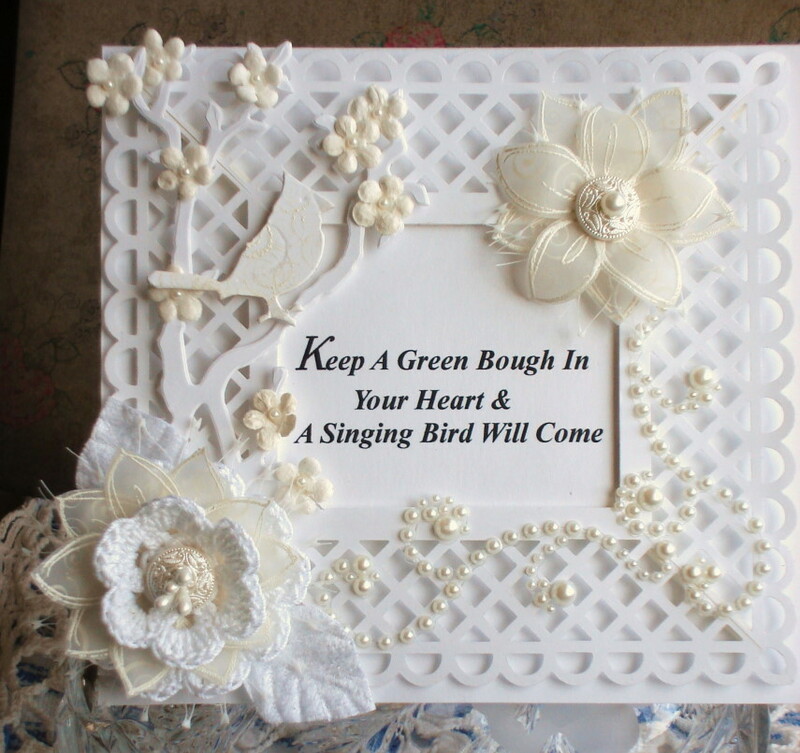 You just master every craft idea you take on, don't you??? I don't believe I've seen such a beautiful use of die cuts! This white on white is just fabulous. Gorgeous, Vada. You really rocked the white on white with this elegant piece! Stunning Vada! Great textures and beautiful decorative edge. I love every single detail. Great take on the challenge. Thanks for playing along with us at Our Creative Corner this week! Oh my your Creation is Awesome!!! Love the frame you made with the punch and the dies are great and your flowers are just Lovely!